There really could not be a better time to talk about the benefits of dental implants with Thanksgiving in Lynchburg upon us. On the one hand the holiday is about mirth, great food, and family. But what if you have to worry about dentures shifting or the discomfort of eating with a missing tooth or multiple teeth. What if you feel uncomfortable at the table because of a gap in your smile. It can both be irritating and a real confidence killer. But it doesn’t have to be that way. It is easy to forget one of the most important, yet overlooked, things to enjoying that meal of turkey, ham, potatoes, green beans, corn, stuffing, pies… I am not talking about a great chef, family, or even an iron stomach that can ingest plate after plate of Thanksgiving excess. I am talking about your teeth! For most of us we take it for granted that we will show up for the big meal and do not have to worry about how we will chew our food. You have a missing tooth. Every time you smile you are reminded of your missing tooth/teeth in your smile. Chewing can become difficult with missing teeth and cause your speech to change. Missing teeth can have a long term impact on your overall appearance and dental health. 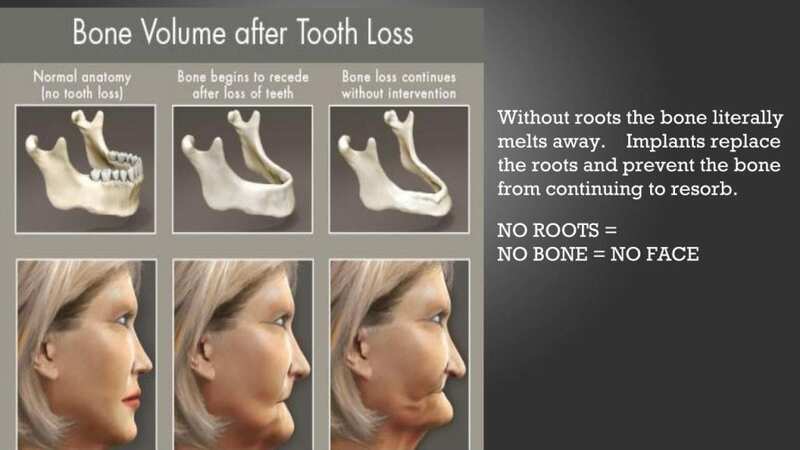 Over time the lack of roots in the jaw leads to the “melting away” of bone. Dentures are one of the most well-known solutions for replacing teeth. Without any teeth the bone will continue to melt away over time and your dentures will become loose. This can make speaking and chewing with dentures both cumbersome and unpleasant. 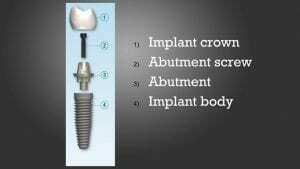 Dental Implants are a great long term solution to give you back the beautiful smile you once had. Dental implants are an option to replace one tooth, multiple teeth, or to stabilize a denture. 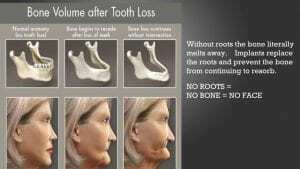 Most importantly dental implants are the only tooth replacement option that maintains your bone level. Dental implant(s) is placed into the bone, some patients may require a bone graft prior to implant placement. A healing period of around 6-9 months is needed for the bone to grow around and stabilize the implant before an implant crown or implant over-denture is made. If you suffer from a missing tooth/teeth or suffer from ill-fitting dentures ask your dentist about dental implants as a tooth replacement option.